Pastel Vintage Bunting, Flag Banners. Wedding, Birthday, Bedroom Decor. CUSTOM, Personalized Banner Bunting, Includes 17 Flags, Up to 15 Letters. A Unique Party Decoration. Made To Order in Your Chosen Colors. Announcement LAST CHANCE SALE - 50% off all items in our "Last Chance" shop section! Welcome to Starlit Nest on Etsy where you’ll find beautiful fabric bunting flag pennant banners for weddings, baby, birthdays, home décor and any other occasion or event. We have been a trusted Etsy shop since 2007, with over 8,000 sales and 2,000 positive reviews. You've definitely come to the BEST place for buntings on Etsy! single layer flags like other less expensive buntings. So these will last, look great and not fray. Plus, we offer super quick turn around times and custom orders. Ask for your FREE mini banner on orders over $50 (before taxes and shipping). Due to the high volume of orders and messages I receive daily I have created a comprehensive FAQ section to save time for my potential customers' and to allow me to focus on finishing the many orders in my queue. THANK YOU! My "RUSH" service puts you at the head of my queue and is $20 (for most items); message me if you would like this upgrade for your order. Thank you! INTERNATIONAL CUSTOMERS: You are responsible for you own country's customs fees. Please do not expect Etsy to tell you in the cart how much your country will charge you for customs of the item being purchased. ALL COUPON CODES MUST BE USED AT THE TIME OF PLACING YOUR ORDER. I can't give refunds if you forgot to use it, thank you for understanding. Keep reading to find out about ways to save $$$ on your order today! Each Starlit Nest product comes with an intention to bring ♥ joy♥ and ♥ beauty♥ to your loved ones, home, event, or photography studio. I bless each item with the hope that it will reflect the innate beauty of all those who ever look upon it. My original creations are made with the highest quality materials and skill. I greatly appreciate all of my kind, warm ♥ hearted♥ customers for their support. International customers: I recommend "Priority" and "Express Mail" shipping which includes TRACKING and up to $100 in insurance! Protect yourself! And order at your own risk if you do not want the shipping upgrade. *Shipment of “ready to ship” banners: same day - 3 days, depending on the number of orders ahead of yours. *Production of “made to order”/custom banners: 5-20 flags? About a week, possibly less. 20+ flags please message me before ordering, it could be up to 3 weeks, but perhaps less, depending on the requirements of your order and the number of orders ahead of yours. *Quilts: varies. Pls. convo me with your desired quilt listing and details of your project. IMPORTANT! I do NOT guarantee arrival dates for my items, ever, so please order ahead of time for special events and photo shoots! A: The best way to order from my shop is to find a ready to ship item that delights you, purchase it from the listing, and wait joyfully for it’s quick arrival. A: Expecting specific colors/prints, customizations, or other alterations be made to a listed item will result in delays and possibly additional charges as well. Some exceptions are listed below. Please read on! A: Yes, as long as the listing description does not say something like “LAST CHANCE” or “only ONE left!”. I will probably be able to make as many as you need. Please send me a message. Q: "What else can I order to coordinate with my banner or quilt?" A: I ♥ *L*O*V*E* ♥ to do custom work, but restrictions and additional charges do apply. Please type “custom” in the search box of my shop or visit my “made to order” & “bridal” sections of my shop and find the listing that most closely works with your needs before sending me a message. General requests are welcome for listings that include the word “custom” in their titles (as well as most listings that say “made to order” but not all). Examples of color/print requests: “blue and yellow” (not: “cornflower and mustard”), “bright gender neutral prints” (not: “little yellow chicks and red/orange squiggles only”). The idea is to keep it very SIMPLE. To a conversation, you can attach an inspiration board or images such as the bedding to be used in the room to give me some direction. SUPER SEPCIFIC requests are accepted on a case by case basis and may (or may not) incur additional charges, depending on the complexity of the project. A: Due to limitations on my schedule (and because of past experiences with some vey needy customers), I can only email ONE photo of fabrics for orders valued at $100 or more free of charge, at your request. Otherwise, there is a $20 per image charge until we come up with the perfect fabric combination for the project. I am sorry to have to do this but it is only because of the high volume of orders I receive daily. A: YES! Please do, as this is the BEST way to be sure that a custom items will meet your needs as far as the colors/prints used. I may even be able to give you a (small) discount on the order. You can also have an online fabric shop send me the fabric directly. A: Probably, depending on availability of required materials. Please send me a message with your requests and I will set up a listing for you. The price will be adjusted in your revered listing. Keep in mind that super long banners and large quilts receive a discount! Remember to keep your requests simple and general for fast service! Q: "I have something special I want written on my banner. Do you add letters to your banners?" A: "Yes! Personalize my ready to ship flags for just $2 per letter or heart. You can suggest a font and/or color if you like, too. I also do hand embroidery/monograms on my quilts for an additional charge. See the last section in my "shop sections". A: Yes, please message me for a reserved listing. Pompoms are $2 per foot and come in white, off-white, pink and green. A: I have several solid trim options that will not incur any additional charges and some printed trims that I could use for a small extra fee. Please send me a message for currently available options and pricing as well as lead time on the customized item. A: It never hurts to ask! Include in your message the image, required size in inches, and general color/print theme for the project. A: Maybe, but maybe not. It depends on how many orders I have ahead of yours in my queue. See the current lead times posted at the top of my “Shop Announcement”. Generally I ship out my items every other business day. A: If your order totals $100 of more AND you have a FedEx or UPS account you can email me a PDF label and I will call for pickup as a courtesy to you. The service you choose MUST include “pick up” (which is usually about $15 extra), no exceptions (except maybe on an order of $350 or more). ALL OTHER ORDERS are sent USPS which does not offer overnight service. I will ship USPS Priority and you should have the the item within a couple of days of shipment if you are in the US. A: Yes I do, but keep in mind I am not responsible for items lost or stolen once they leave my possession. This is an important point and one that many people will argue with, but based on years of selling on Etsy this is the policy I have chosen. The postal service gives proof that the item was shipped, but tracking and insurance are EXTRA charges, options you may decide you want to purchase but they are NOT included in the shipping prices I have set for my shop. Please convo me if you want to include these services in your shipping charges. The (ONLY) 2 negative feedbacks I have received were from someone who disregarded this policy and blamed me for her package getting lost. It is unfortunate, but she received negative from me as well for rudely criticizing my shop policies. I have no idea if the items were even truly lost. -♥ - Sometimes I put one near the top of my “shop announcement”. -♥ - I randomly but frequently announce them on my FB fan page. They are usually only good for 2-3 days. -♥ - If you have a relatively popular blog with a “Links I Like” kind of page, or have a place for a button that can link to my shop, I will give you a one time 10-15% discount on any order in exchange for the link. But this offer is subject to approval on a case by case basis. A: Yes, please see my shop announcement for current special discount offers and “gift with purchase offers”. A: I give out coupon codes to everyone, photographers and non-photographers. I may have some banners in my shop that need professional images which I can exchange for a discount refund, but please contact me before ordering to make sure the one you want qualifies. I usually give a 10% refund in exchange for 3-4 watermarked images that you give me permission to use as I like. A: Email my “Preferred Retailer’s Division” directly at starlitnest [!at] gmail.com with “Wholesale Status” in the subject box. As seen on the Ellen Show and Better Homes and Gardens Make It Yourself Magazine! THANK YOU FOR READING MY SHOP POLICES BEFORE CHECKING OUT! LAST CHANCE SALE - 50% off all items in our "Last Chance" shop section! Welcome to Starlit Nest on Etsy where you’ll find beautiful fabric bunting flag pennant banners for weddings, baby, birthdays, home décor and any other occasion or event. We have been a trusted Etsy shop since 2007, with over 8,000 sales and 2,000 positive reviews. You've definitely come to the BEST place for buntings on Etsy! Carnival Theme Happy Birthday Flags. A Unique Party Decoration. Polka Dot Letters, Striped Trim and Gender Neutral Flags. Custom Banner, 11 Flags, Fabric Bunting Pennant Banner, Wedding Decor, Photo Prop. Custom 10' of flags, HUGE SALE Colorful Fabric Bunting Banner Prop Decoration in Orange, Green, Yellow and Aqua. Designer's Choice. 120' of Solid White Bunting Flags, Event Decoration, Cotton Fabric Wedding Garland. 3 at 40' each. Free US Shipping too. Made To Order. Custom Banner, 13 Flags, Fabric Bunting Pennant Banner, Wedding Decor, Photo Prop. Custom Bunting, 5 Large Fabric Flags Featuring Cotton Fabrics in Your Favorite Color Scheme. Personalization Optional. Designer's Choice Carnival Banner, Fabric Pennant Flags, Med. Flags in Red, Yellow, Blue & White Party Decor, Prop. 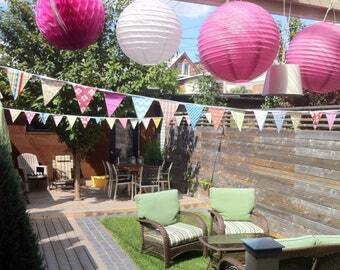 Kids Room Decor CUSTOM 40 Foot solids Bunting, Wedding Party Flags, Birthday Decoration, Photo Prop. LARGE Flags 100 percent Cotton Fabrics. Flag Banner Bunting in Spring Colors, Surprise Fabric Pennant Flags, One of a Kind, Designer's Choice. Photography Prop, Decoration. ONE Prescription Pad Keeper For The Doctor In Your Life. Rx Holder, Sleeve. Also Works Great For Postcards. This items was even more beautiful that it looked on line. And the seller was an absolute delight to work with. Would definitely work with this seller again. Thank you! 14 flag length UPGRADE: Add WHITE Pompom Trim to ADD to your Fabric Flag Bunting. The banner looks great! And the shipping was quick! Love it and very fast shipping. 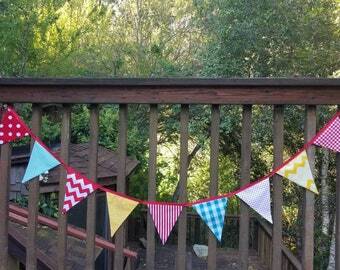 Colorful bunting, perfect for spring!!! ...I am here to help bring your dream to life! My huge inventory of designer fabrics and my vintage-modern style are what make Starlit Nest the place to shop for bunting, quilts, and bunting/quilt set ups! Please read my shop announcement and FAQ under the main banner in my shop. I have included information to help get the project underway quickly. If you still have questions you are welcome to send me a convo and I will help you any way I can. I am so blessed to have such a successful business. My devoted customers keep me inspired to create new, unique, original designs with only the very best materials available. Please read my shop announcement before sending me a convo! Thank you for giving me the opportunity to serve you. I put all my heart into my handmade items, and your satisfaction is my priority. Please let me know if you have any concerns or special requests. ☆My fabric shop: www.starlitnest.etsy.com and my prescription pad cover shop: www.stylerx.etsy.com ... I have nearly 8,000 items sold and 100% positive feedback. Not to mention all the sales and great feedback in THIS shop! I have 100% positive feedback after selling thousands of items: for the craftsmanship of my items (and my fantastic customer service). Handmade items often have a handmade, not factory made look. It is possible that your item will have characteristics that make it unique and special, and by checking out of the cart you agree that small imperfections are part of what makes a handmade item wonderful. HUGE imperfections are another story, so please email me right away if you notice something I may not have caught... for whatever reason! I will work with you to make sure you are totally satisfied. Please do contact me before leaving a review, as with all shops on Etsy. CUSTOM: No returns or exchanges on custom orders, sales on all custom merchandise is final. However, I may make an exception for you IF I can sell it for what you paid and the item is returned in new condition. If you need something customized after you receive it, you are welcome to message me about it, and I'll see what I can do. Shipping fees back to me, and to return the item back to you are your responsibility. CC and paypal gladly accepted. Checks/Money Orders: If you need to write me a check I can hold the item for you for 3 days. After cashing your check I can send your item. I will not start working on your item(s) until payment clears. There may be a few orders ahead of yours, so please convo me if you have a deadline for the item(s). US Customers: your banner ships via regular first class mail unless the package weighs over 13 ounces. if you would like to pay for insurance or need to upgrade to Priority Mail or Express Mail, please let me know and I will invoice you. I do not guarantee delivery/arrival dates for my items because I can't be responsible should USPS take longer than normal to deliver your item. If you need your banner right away and prefer to have it shipped Express Mail, let me know and I will adjust your listing or invoice you for the upgrade. International Customers: You are responsible for any customs fees charged by your country. Every country is different and there is no way for Etsy sellers to know what you will pay for your item, if anything. We can't include this fee in our shipping charges. Thank you for doing the research necessary to inform yourself about your particular country's custom fees. AND Please do not ask me to lie on your customs form and say it is a gift or give a lower value than what you paid. For one thing, Etsy prepares the label, not me, and secondly you would be asking me to commit fraud. I include in my shipping prices a VERY small handling fee included in what you pay for shipping that helps me with paypal and etsy fees, travel to and from the post office, and packaging supplies. If there is a gross over charge of shipping let's talk about getting you partial refund! "RUSH" orders will incur an extra fee, depending on the type of project. Please inquire if you need something in a hurry. ***Please accept my apologies if I am not able to respond to your convo immediately. Thank you for your support, and please "like" my Facebook page: Starlit Nest GIfts. Fans receive coupon codes for all of my products. If you are a professional portrait photographer, please convo me for additional discounts in return for trading photos of banners that I do not have photo of yet AND a mention on your blog and facebook fan page. Again, as with any seller on Etsy: PLEASE contact us BEFORE leaving feedback if it is 3 stars or less!